#Corset Diet, yes or no? Also called “waist training” has hit mainstream and the Hollywood crowd over the last few years. For centuries women were FORCED to “widdle their middle” into these tight, restrictive and unbearable contraptions. Now, celebs like the Kardashians and Jessica Alba swear by these “devices”. Jessica Alba stated she wore hers day and night for 3 months after giving birth and credits wearing this contraption for her weight loss. 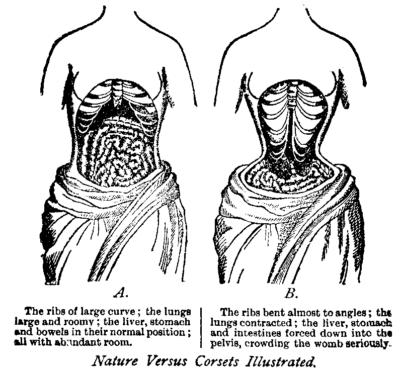 Do you lose weight with a corset? Well, science says NO WAY. I have worn one of these, and actually have it in my closet. It is great to help you nip and tuck away what you are trying to hide, but can become quite disappointing when you squeeze yourself into a sausage and find your “excess” spills over the top… not a pretty look ladies! Next, these things are painful! It hurts to have a contraption wrapped around you so tightly you can barely sit down. The more expensive ones have metal boning in them that keeps everything pretty upright, which isn’t all bad for sitting at a desk all day because it definitely improves your posture. I found I had difficulty breathing in it. The tighter you cinch the corset the more you constrict your diaphragm, so don’t even think about working out in it… that can be dangerous because it restricts you from taking a full breath. Oh, one theory on weight loss is because everything is slammed together in your gut you eat less and aren’t as hungry. Well, yes and no. You for sure can’t eat as much food because there is no room for it in there, but this can also cause acid refluxing because too much food may find it’s way back up into your esophagus and that simply is not pleasant. Be prepared to run to the bathroom more often, because when everything is squished together, it pushes your colon along a little more. Finally, and this is the worst of all the things I experienced, it compresses your rib cage which can be dangerous. A slight turn in the wrong direction while contorted and compressed can result in a torn intercostal ligament (between ribs) which is excruciating and will result in weeks of missed gym days and many sleepless nights. If it gets REALLY bad, you can actually crack or break a rib, which sets you back even further. Why do I tell you this? Because I suffered torn intercostal 3 times and 2 cracked ribs in the several months I wore this contraption. Bottom line, though it looks like the next best thing since buttered bread, please think twice. Abs are not made in a waist trainer, they are made at the dinner table and at the end of your fork. Hard work, consistent exercise, plenty of sleep and rest and consistency and dedication is why creates that beautiful waist ladies!